HSSC Patwari Recruitment 2019, Haryana Gram Sachiv Recruitment, HSSC New Recruitment 2019, Patwari Recruitment Online Form. 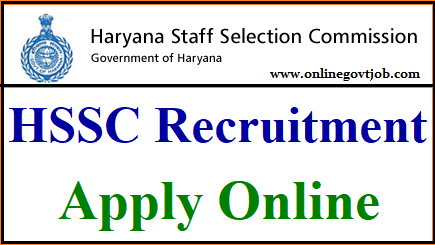 HSSC Patwari Recruitment 2019: We inform you that the Haryana Staff Selection Commission department issued a notification for Gram Sachiv or Patwari vacancies. Candidates who are interested in the Haryana Patwari can apply online application form before the last date given below. HSSC new recruitment 2019-20 notification publish. Check here for the latest update. Haryana Staff Selection Commission Recruiting department release many posts every year. This is a golden opportunity for candidates who are interested in it. Eligibility for the candidates who hold eligibility for Gram Sachiv or Patwari vacancy is given below. Canal Patwari: For this post, they will be eligible candidates who have passed the High School level examination (Class 10th) from any recognized board. Village Secretary (Gram Sachiv): For this post, they will be eligible candidates who have passed Intermediate (Class 12th) level examination from any recognized board in India. HSSC Patwari & Village Secretary vacancies – The candidate must have for Canal Patwari 18-42 Years old and Gram Sachiv 17-42 Years Old. Note: Age relaxation applies to the candidate as per HSSC recruiting rules. Payment Apply Mode: Debit/ Credit Card/ Net Banking & HSSC any other mode available on the HSSC official website. Our web portal onlinegovtjob.com is not responsible for any query or mistake. So suggested to candidates that please check also the HSSC Recruitment official website notification.